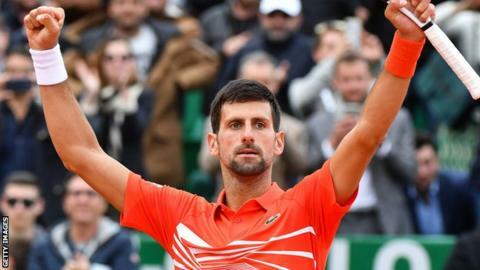 World number one Novak Djokovic smashed his racquet during his frustrating three-set victory over Philipp Kohlschreiber as he reached the Monte Carlo Masters last 16. The Serb, who lost to Kohlschreiber in the third round at Indian Wells in March, prevailed 6-3 4-6 6-4. Djokovic also threw his racquet into the crowd as he struggled to close out the match. British number two Cameron Norrie earlier reached the second round. Norrie beat France’s Adrian Mannarino 6-4 6-3 to set up a meeting with Hungary’s Marton Fucsovics. Djokovic, who received treatment to his thumb during the first set, committed eight double faults. Kohlschreiber tested Djokovic but was unable to make his opportunities count as the Serb saved 12 of the 16 break points he faced. “It was not the prettiest of matches,” Djokovic, 31, said.